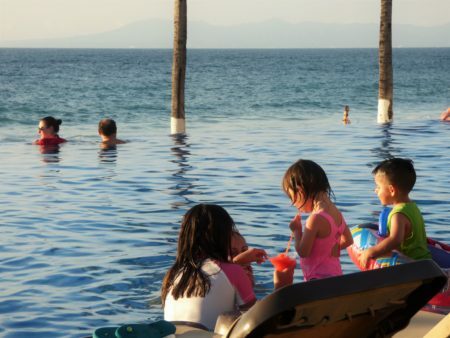 Finding the right resort for your family down time. We spent our winter break seeking outdoorLUX “South of the Border”. What do I mean by outdoorLUX? Simply, enjoying life outdoors without compromising comfort or sophistication. 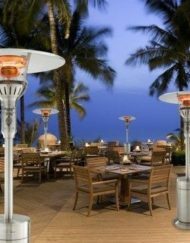 More often these days we discovering resorts, restaurants, and activities that offer real luxury in an alfresco setting. Where you can take in the awe of God’s great creation and breath fresh air, while still eating well and relaxing as comfortably as you would inside. Plastic tables and burgers on paper plates do have a place in our lives. But we also enjoy a soft chair in the shade with a crystal glass of Pouilly Fuisse on occasion. And activities that make it possible to enjoy the outdoors from a different perspective. Like a hot air balloon ride over wine country or horseback riding through a grove of aspen trees blazing with fiery yellow brilliance. Where did we find the best outdoorLUX on our trip? And is possible to find it at an all-inclusive resort? Here’s what we learned. Goal – Finding outdoorLUX on a family vacation South of the Border. 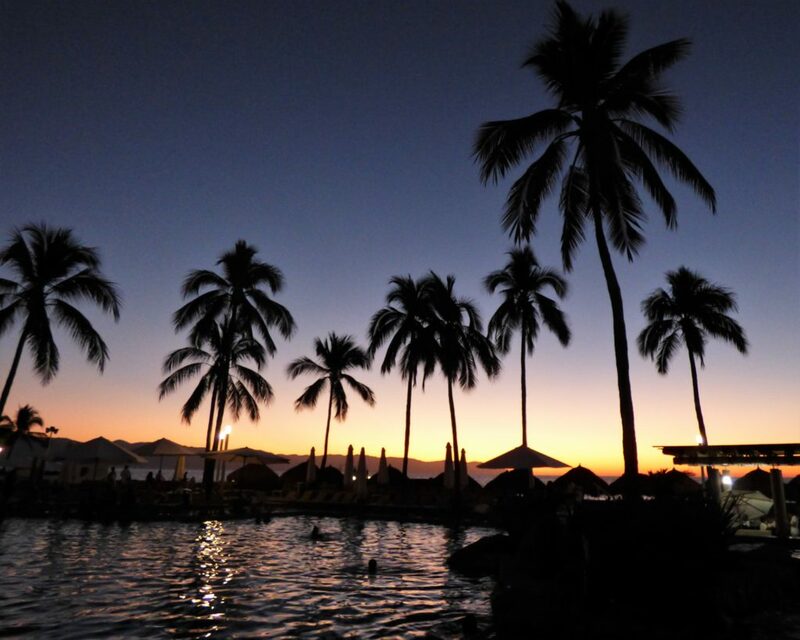 The beauty of a Mexican sunset can be enjoyed with drink in hand at the Sheraton freshwater swim up bar. The Sheraton Buganvilias is a large centrally located beachfront resort. We definitely enjoyed some outdoorLUX moments here. 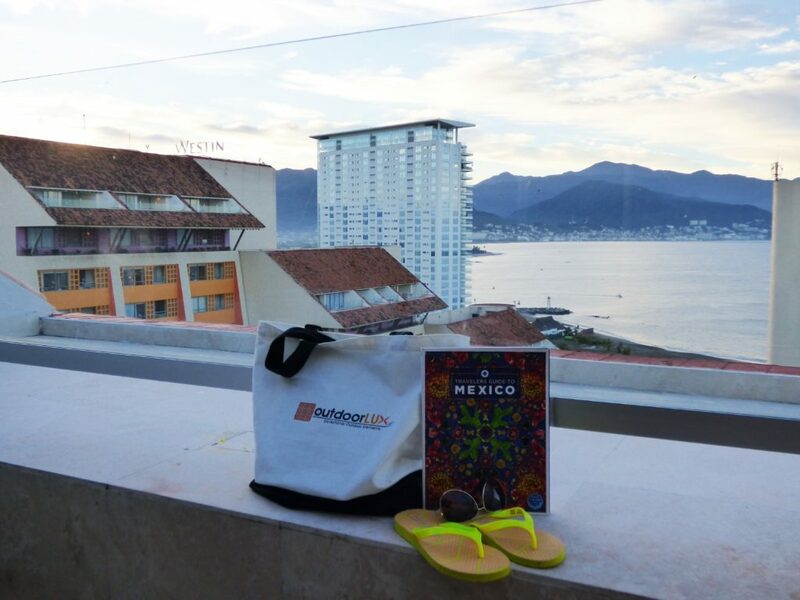 While it didn’t prove to be our most luxurious choice, it was a perfect start to our Puerto Vallarta adventure. Here’s why. It is very comfortable, well located, and offers the choice of both all-inclusive and standard rates. We choose a standard rate because we wanted to see some of the nearby historic downtown and dive into Mexican culture and food. My experience is that this is only really possible off resort properties. 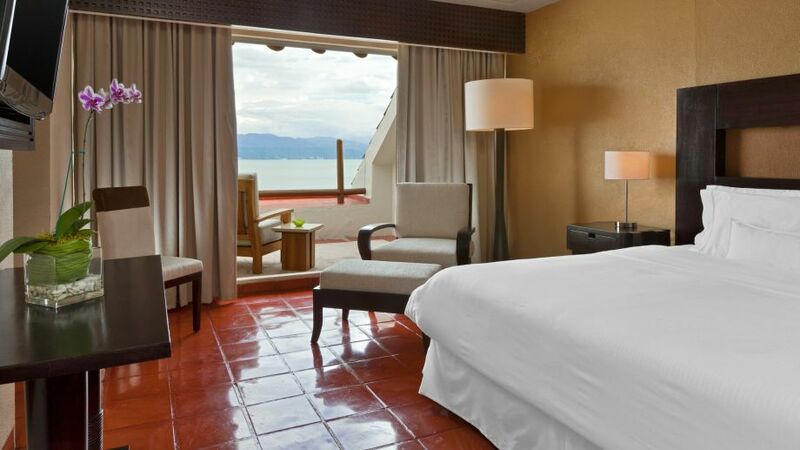 Due to the Sheraton’s great location, it is possible to walk downtown and to the “Malecon” from this resort. But taxis are so inexpensive ( and drivers so friendly and full of advice) we choose to take a cab everywhere. We never had difficulty finding one on the street to return home. While at the resort we dined well, slept well, and never fought for a lounge in the shade with a view. Because getting up at 7 am on my vacation to “reserve” (fight for) a chair is NOT outdoorLUX. Since we are members of their Starwood elite program (join now) we were offered complimentary entrance to their Club Lounge. 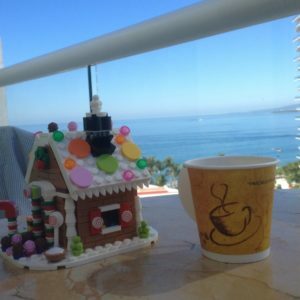 Breakfast, sweeping Banderas Bay views, a self serve fancy coffee machine, and snacks or cocktails all available in a nice setting. However this is an adult only lounge, so that did limit our family use of it. We happily paid for the deluxe weekend oceanfront breakfast buffet at La Villita. It was a highlight of our trip. This was a great alfresco experience. Yes, a buffet can be outdoorLUX. Here’s how. 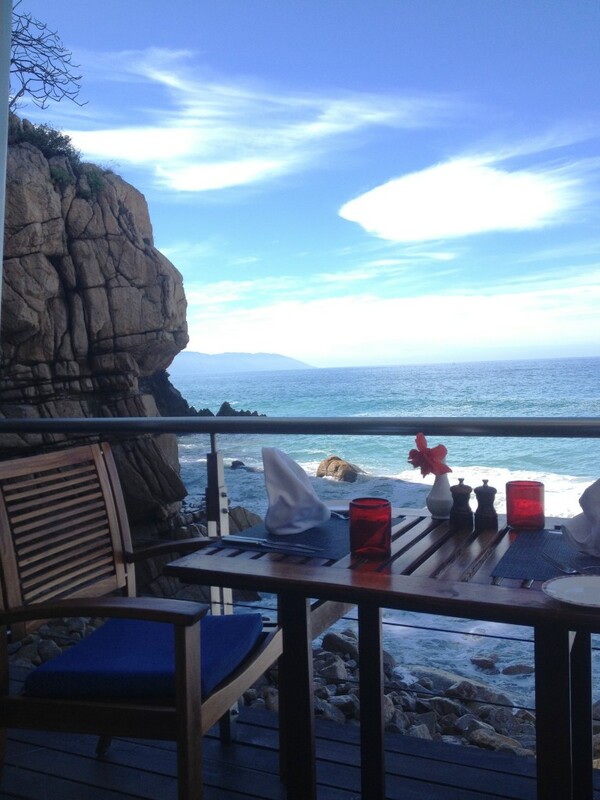 Great fresh food choices, local items, views, and live authentic Mexican music on a huge Marimba. All of this oceanfront in a comfortable chair in the shade.When traveling with kids, a really good breakfast buffet can be your best friend to fuel your little ones with food they love. No risk. 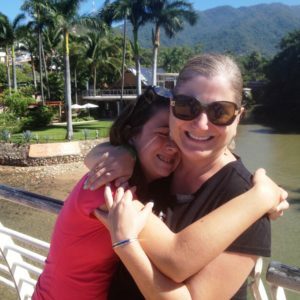 As long as they have wonderful fruit, cheese, and baked goods for me and keep the hot coffee coming- I am one very happy Mom. I can sit through three kid trips to the buffet soaking up the view and music while sipping coffee. No problem. The La Villata offered up cooked to order eggs as well as some of the highest quality produce and baked goods we enjoyed during all of this trip, which is unexpected at a buffet. What a nice way to start to our family vacation. 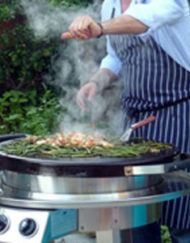 The only other property restaurant we tried was Alfresco Trattoria, the small outdoor Italian cafe. It had a lovely though limited menu. We enjoyed hearing the ocean by lantern light and everything we ordered. My daughter was very happy to see pizza. The Caprese salad was my favorite. The chairs and setting weren’t perfect, but the overall experience was good. A short cab ride away offers up The River Cafe or Oscars. Both offer fine dining in transporting alfresco atmosphere. But sometimes a night at the resort is just what you need after a day adventuring. 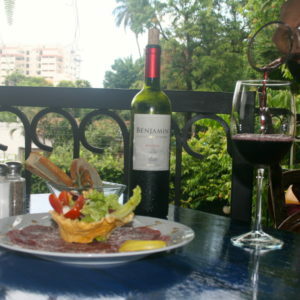 The River Cafe offers real outdoorLUX dining in Puerto Vallarta. 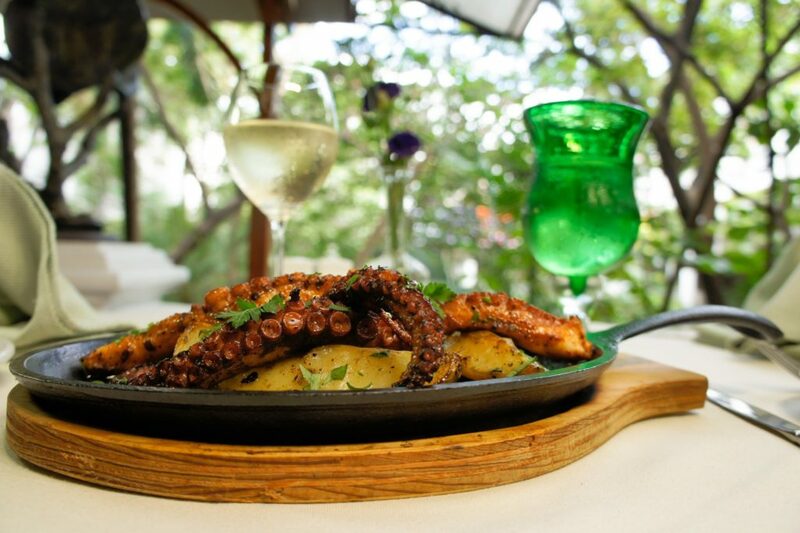 Pictured here, Pulpo and Los Vascos Lafite . Yum. The two pools at the Sheraton are free form and large but slightly dated. No infinity edges or exotic foliage. But parents of younger children will really appreciate the extended shallow area. That is luxury when with little people. We enjoyed the water volleyball court and swim up bar. No great views of the ocean here, but privacy from the abundant vendors on the beach was a plus. There were also several outdoor activities offered poolside thoughout the day. On the down side, check in here was excruciatingly slow, so put on patience. Once we were in the rooms we felt much better. The resort did do a nice job making you feel like you were both in Mexico and at a familiar Sheraton. The fluffy beds and big TVs were accented by bold colors and Mexican artwork. Big windows to allow in ocean breezes and panoramic views. 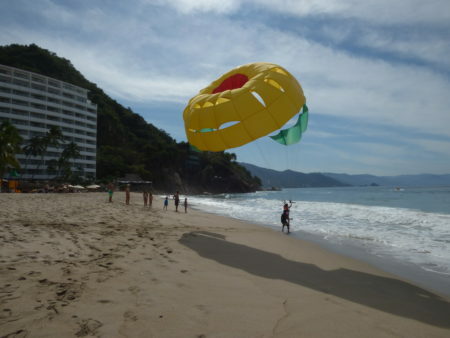 A great soft landing for our Puerto Vallarta Adventure. Walking around Puerto Vallarta was a pleasure. Wherever you stay, get off property and into town to experience it. I would come back and I would recommend this property for family vacations. I think you get a lot for your money here and are extremely well located for exploring the town. I believe I would still skip the all inclusive option. 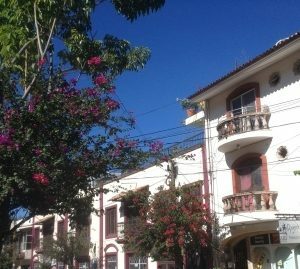 The historic charming town of Puerto Vallarto has such great food and colonial atmosphere for a bargain price. And the resort prices were very fair as well for an occasional meal or drink when you don’t head out. Not just a beach town, this port has a historic past and feel toit. Strolling down Basillio Badillo in the Zona Romantica made the name choice clear. Upscale unique shops selling authentic Mexican jewelry, clothing, and artwork were dotted with bakeries and outdoor cafes to refuel. So much of Mexico is filled with cheap junk from China, but not in these stores. 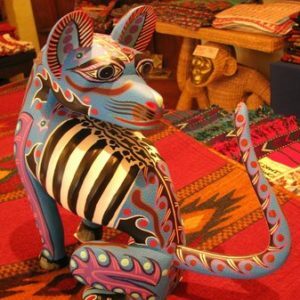 Don’t miss Lucy’s Cucu Cabana for well priced and artisan signed Mexican Folk art for a super souvenir or gift. Or if you simply need any local advice, stop in Lucys and ask Nancy who works there. She has a wealth of knowledge which she is happy to share. Or get both art and tapas in one stop at the charming Di Vino Dante down the street. And ask to sit on the second floor balcony. 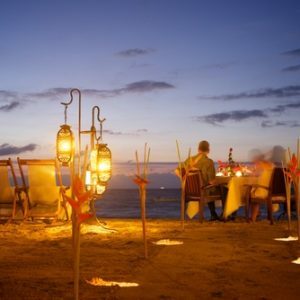 A meal with your feet in the sand at La Palapa is also a great choice in this area of town. We choose it for our Christmas dinner. They have great holiday specials and serve all hours. The tapas and art at Di Vino Dante won’t disappoint. The Charming wooden Oaxacan animals will tempt you at Lucy’s Cucu Cabana. 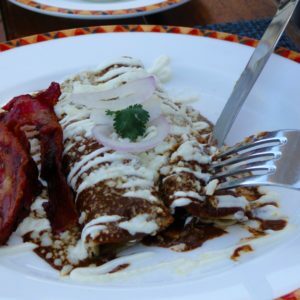 La Palapa offers the kind of meal usually reserved for a high end city restaurant. But with your toes in the sand. 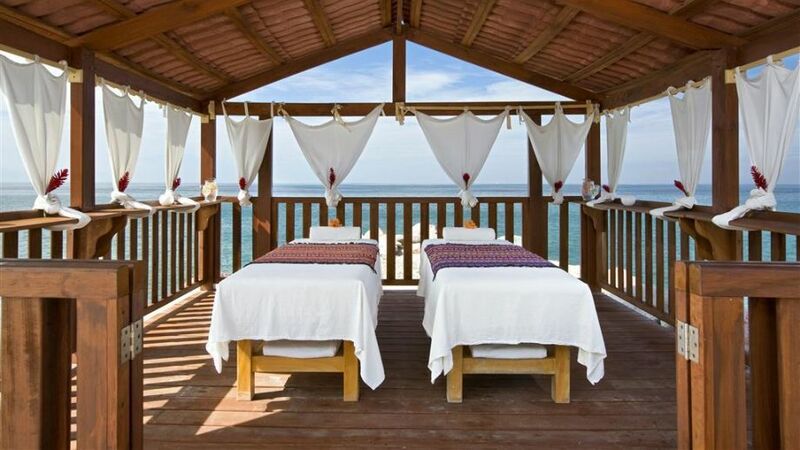 Sheraton offers couples massages on the beach in a private hut, outdoorLUX indeed. The Hyatt Ziva is a breathtaking resort with plenty of space to stretch out. 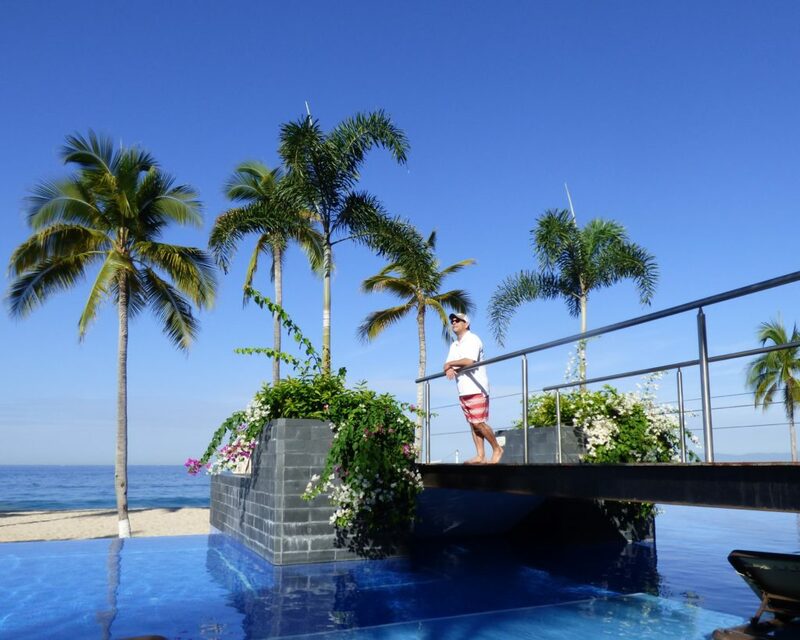 Our next resort choice in Puerto Vallarta was the new Hyatt Ziva. 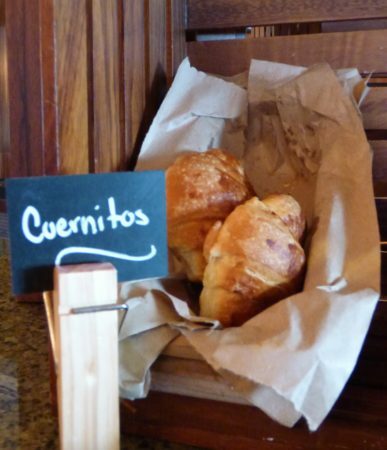 This is a new brand for Hyatt and a big reason we decided to vacation in Puerto Vallarta. They claim to be “The Evolution of all inclusive luxury”. Promising gourmet no reservations dining options, entertainment, classes, kids activities, and extras like room service and mini bar included. The pictures and tag line sseemed great, but did they deliver? How much outdoor luxury would we find at an all-inclusive? The truth is a lot, but it wasn’t perfect. first the good. 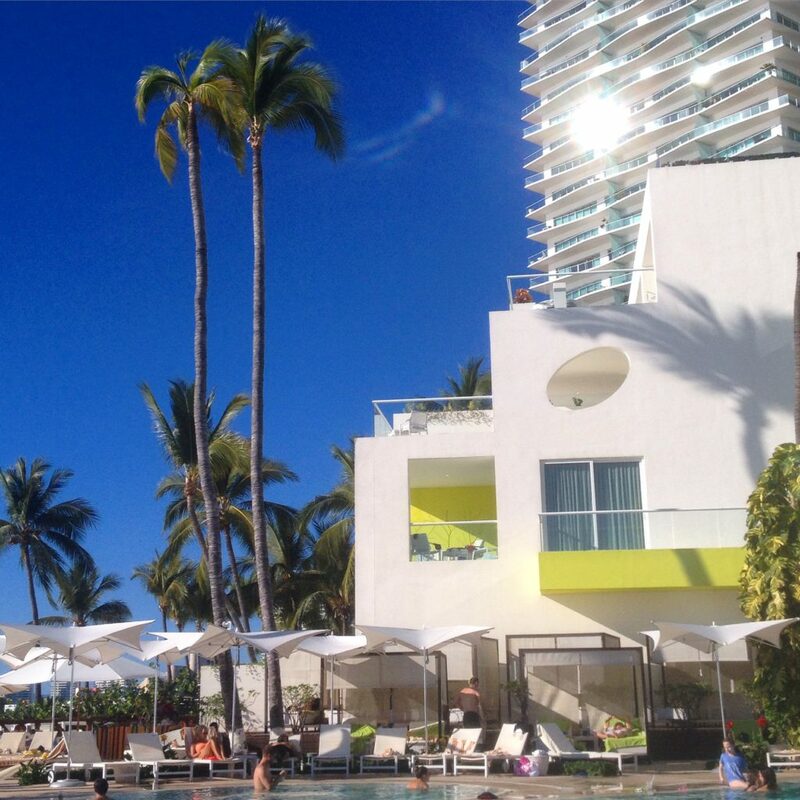 Pool and Beach time were wonderfully luxurious at the Hyatt Ziva. The Hyatt Ziva is a stunning resort. A feast for the senses in both setting and design. Feeling much more like a boutique luxury hotel than an all inclusive right away. No wristbands required. Almost entirely open air and alfresco with a postcard perfect location. We were swiftly checked in, offered a cold drink and cool hand-cloth, and had to catch our breath at the second floor open air lobby views. We made a quick trip to their lovely coffee bar and were blown away by the level of service and wonderful food options including numerous baked goods, tropical fruit bowls, and fresh house made ice cream to go with barista classics. Just wow. 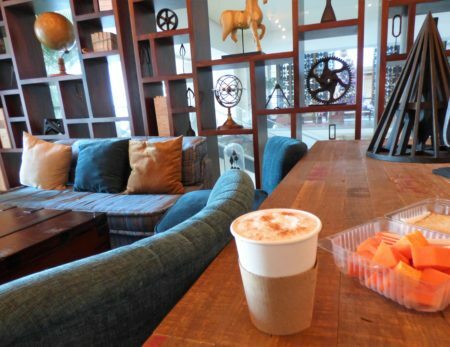 Perfect cappuccinos and tropical papaya. Our daughters favorite culinary discovery of the trip- cuernitos. One of our favorite spots to grab an impromtu picnic or dessert was the 24 hour cafe. The rooms and bathrooms were all well appointed. Fluffy beds, rainfall spacious shower with bench, and sweeping views. Fantastic start. We had lunch at Blaze restaurant and felt the staff was flawless. The food fresh and local, we enjoyed fish tacos, caesar salads, and Ensenada Mussels in white wine sauce on their idyllic patio overhanging the Pacific ocean. Complete transporting outdoorLUX. 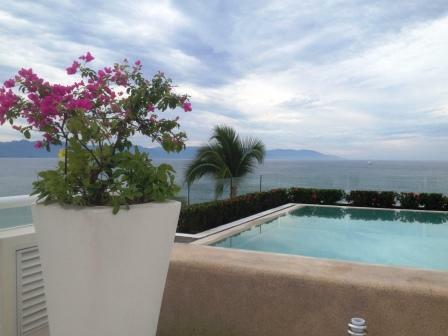 Followed by a beach walk over to the infinity pool with a chaise half submerged in the warm blue water. A perfect first day. Those looking for more activity could try the state of the art fitness center, tennis courts, or paddle out on an included board. Less successful aspects of our stay included the Italian restaurant, the pool drink service, the rowdy guests, and the lack of activities for older kids. By dinner the “gourmet evolution” had morphed back to a more typical all inclusive feel. Painfully slow service in the Italian restaurant and very mediocre food was followed by a pretty decent “circus show” outdoors. The performers were talented, but the straight back uncomfortable chairs were not exactly 5 star. The pool and beach both always had a place to sit in the shade and never felt crowded. And although I struggled at times to get a smoothie or glass of wine, it seemed others did not have any issue getting quite a few drinks. The all inclusive unlimited drinks did take its toll on both the atmosphere and volume level. Not our best idea of family vacation atmosphere. But in fairness, this an issue with most all inclusive resort. We simply moved seats (more than once). The food by the pool was of the cafeteria variety ( none of those fresh mangos like in the photos online) and the service very spotty. It was often an hour wait to get a clean towel. That’s just unacceptable at a resort based on the enjoyment of water. 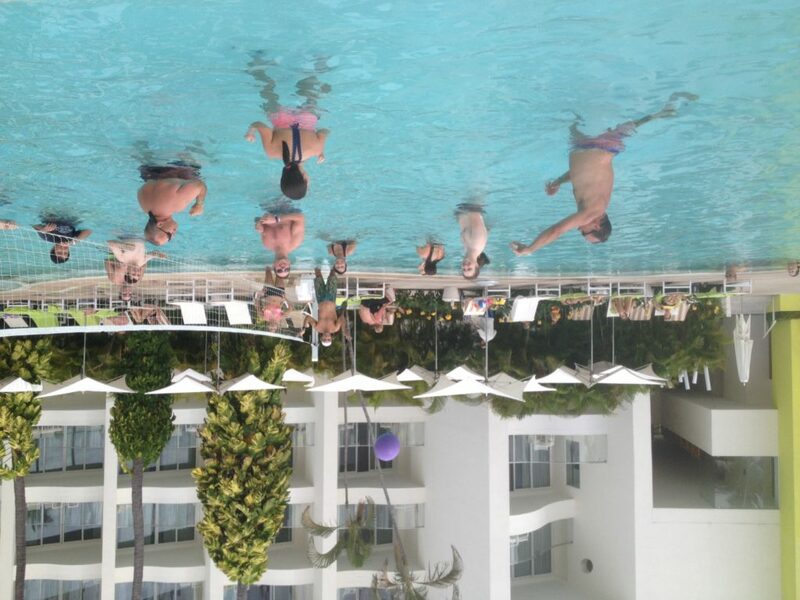 Our tactic became to enjoy the stunning pool and beach with water sports and then head over to Blaze for lunch daily. And the advertised classes? Kind of a joke. Like in “cooking class” was guacamole poolside on a plastic table mashing up an avocado. Don’t expect much. OutdoorLUX fail. 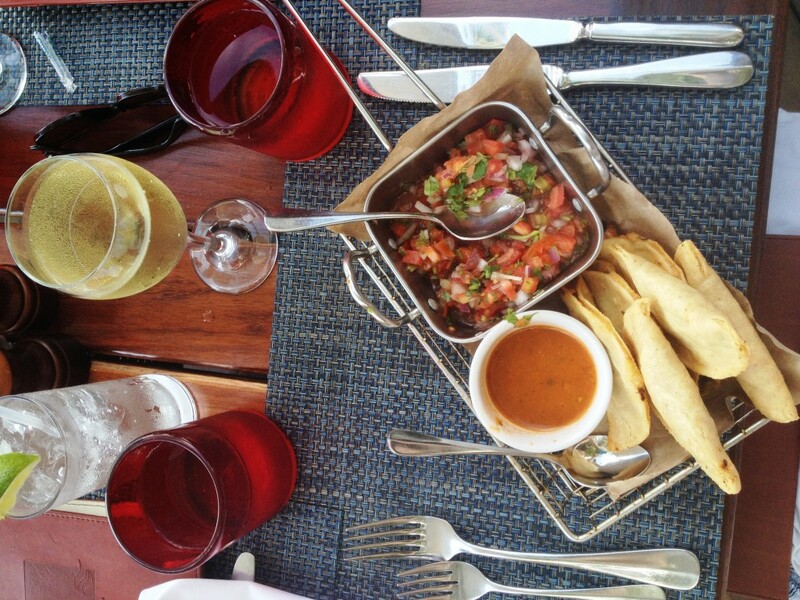 They brought us over some mini fish tacos while we looked at the menu and enjoyed some crisp cold wine and the view at Blaze. The view at Blaze kept us coming back for more. 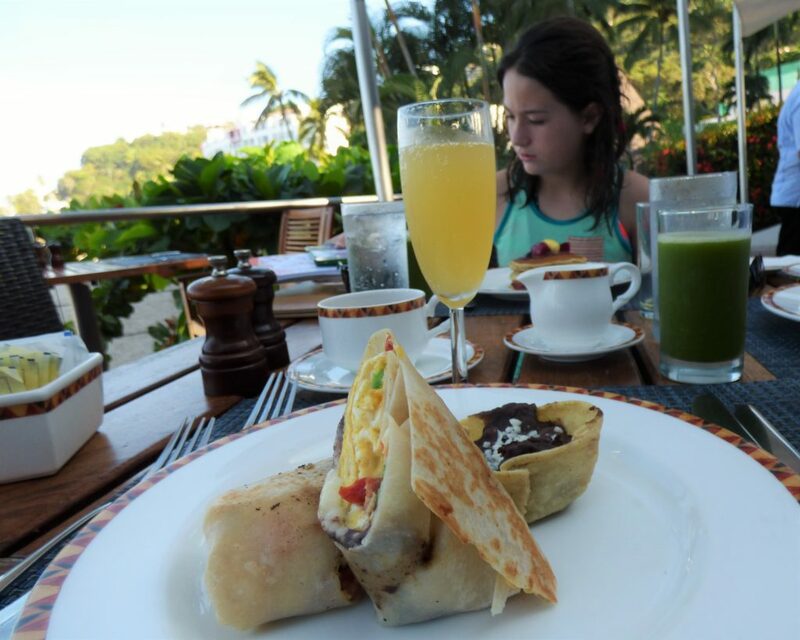 Breakfast burritos and b=green smoothies with champagne- must be vacation. The buffet was above average but a bit crowded. The circular Mexican restaurant served truly unique dishes not typically found north of the border like Zarandeado fish with cactus confit or wild boar carnitas. But the hot queso fundido with freshly made tortillas were what got gobbled up. We do travel with an 11 year old. Casa Grande had an authentic hacienda ambiance and warm service. The Asian PureZA was tasty, but less atmospheric and authentic (Great for take out to the room). It is nice for appetizers at sunset I think. Overall for dining, kind of a mixed bag. But with real high points. The entertainment was always enjoyable, with only the crowds of Mexican Fiesta Night sending us running for an alternative. The lobby areas had wonderful views and comfortable spots to relax. The spa was lovely and fairly priced. 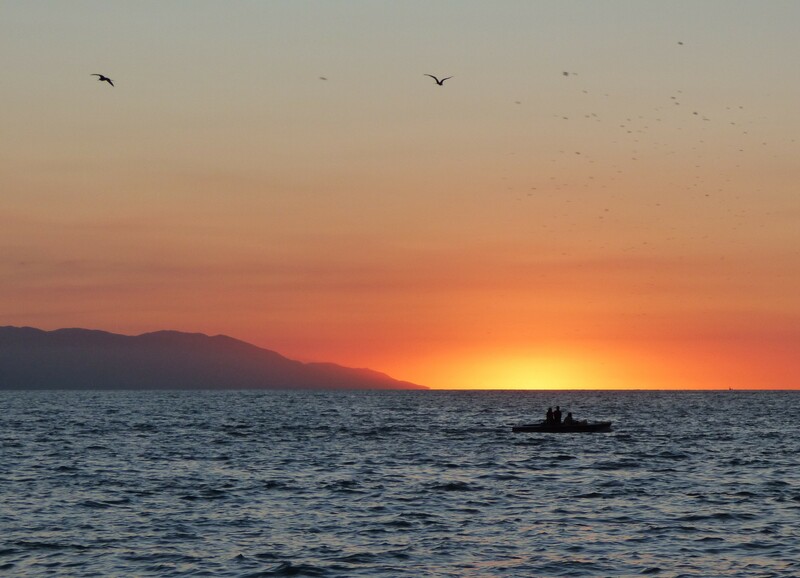 The quiet beach was easily our favorite in all of PuertoVallarta. Secluded and scenic with lots of included watersports and just a few friendly vendors. Some of them offering boat rides or parasailing over Banderas Bay. 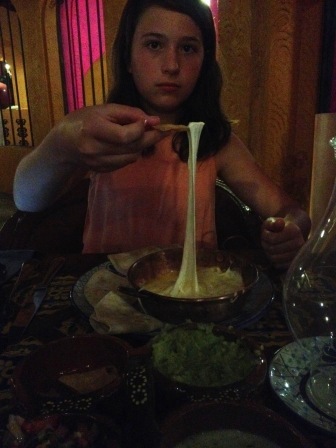 Queso at Casa Grande was a quick kid favorite. We had to order another one to get a taste. That look says, “Keep your chip to yourself Mom”. This is not a bargain resort but does offer a lot for the money. I would go back again. If I had younger children to take advantage of the huge kids club, I’d really recommend it. The lack of things for kids over 8 to do makes the drinking scene a bit overbearing at times. But we could always find a quieter place to escape and have fun together. But for a honeymooning couple or a family with younger kids this would be a great place to vacation. It was not a total evolution of our feelings about all inclusives. We did however thoroughly enjoy our time there, bumps and all. 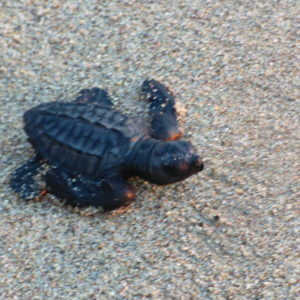 Many of the hotels in Puerto Vallarta offer baby sea turtle releases you can attend, including the Hyat Ziva. 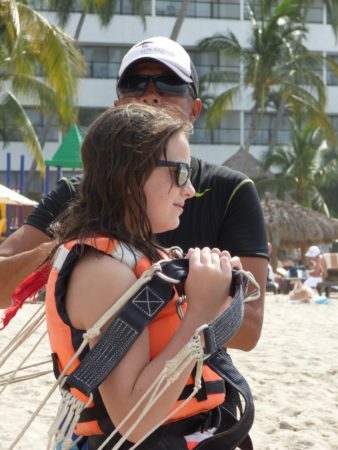 Charlotte gearing up for a little parasailing over Banderas Bay. 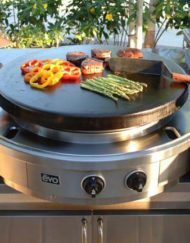 Looking for real outdoorlux? book the Presidential Suite at Hyatt Ziva. 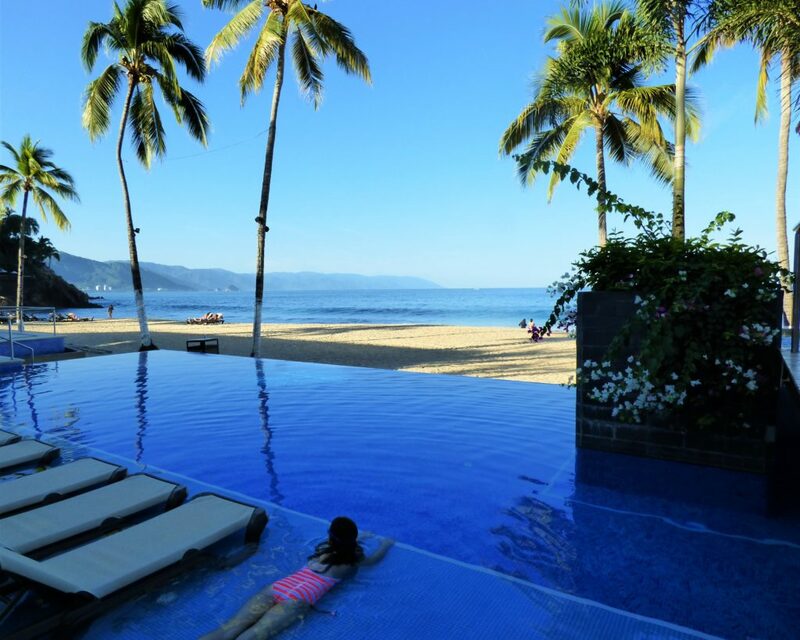 The Hilton Puerto Vallarta is one of the handful within the chain that operates as an all inclusive only resort. It is tucked in a wealthy development with a busy beach scene. This resort paled in comparison to our stay at the Hyatt Ziva on most accounts. It felt like each day had some struggle to it. Always something to enjoy, but to overcome. Perhaps if we hadn’t just left the Hyatt, these faults would not have been so apparent. Because this is a stylish resort with some great service. The pool butlers were complete 5 star employees and made for the most enjoyable times of our stay. The spa workers were skilled and friendly (ask about the Hilton Elite specials!). The activity director was charismatic and funny. But the resort itself felt small and limited. The kids club was really small and truly best for very young kids. At no age would my daughter have been content here for more than an hour or so. The adults only pool was beautiful, but with no activites for our 11 year old we only got up there once. And the advertised open air sushi bar? It was easy to skip, think canned tuna on bland rice. yeah, no. View from the rooftop adult pool. The ocean view buffet was also very diverse and pretty good. Never crowded. The decorations and food variety for Christmas brunch and dinner was over the top. Other evenings it was a less impressive. In fact we walked across the street to Outback for a steak one night rather than eat there. 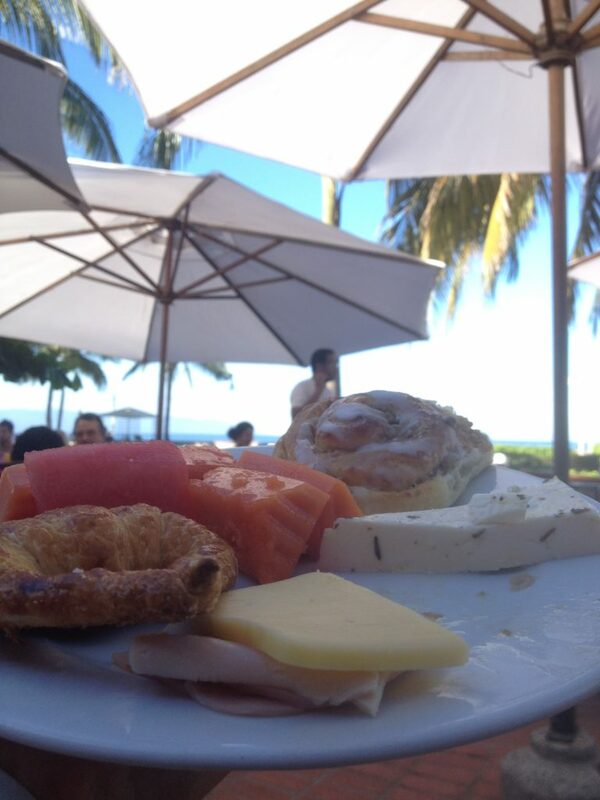 The best experiences for us were lunch and breakfast outdoors with the views and breezes. The adults only “French” restaurant? It was practically inedible. And bad service to boot. And no decent wine. I pity the Frenchman vacationing here that tries it. That will not stay open with the quality of food we were served. And the Mexican was very average, you fare just so much better to venture outside the resort. Not exactly what you’re paying for at an all inclusive. 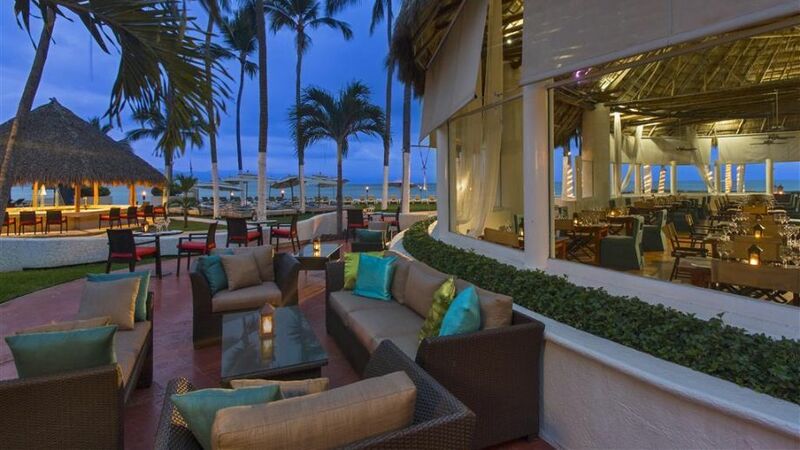 The beach side Fogo the best evening option. It was decent chain style Brazilian, but was very difficult to get a reservation so we dine there only once. They had coffee cafe inside, but after the Hyatt we were spoiled. The food choices were very limited and often stale. The coffee drinks were far below Starbucks standards. The over sized chess game adjioning it did keep us coming back anyway for some family time and hot cocoa. And again the barista were so very pleasant. We often enjoyed late afternoon legos and espresso our on our lovely balcony. 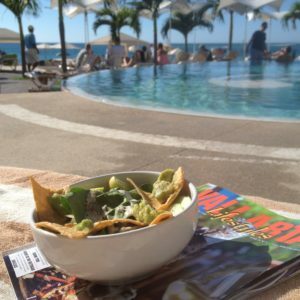 I enjoyed a lot of guacamole and salad poolside at the Hilton. We love the idea of the Hilton Cafe, but it wasn’t the Hyatt Ziva. 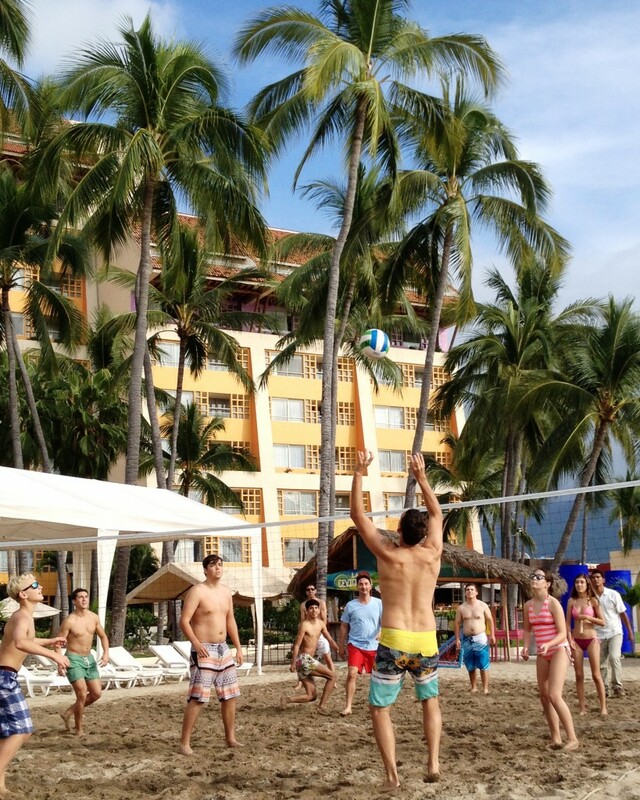 I think we played volleyball everyday in Puerto Vallarta. Great for making friends from other places. The volleyball games and kayak tours were well organized by the talented activities director. But whoever was in charge of evening entertainment was a complete failure. NOTHING to do at night beyond drink and sometimes a brief solo musician in the lobby. When the sun went down, we felt like leaving. For that reason I don’t believe I would go back here. The beds were nice, the service was great. 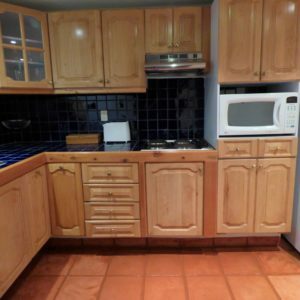 But with poor food, no entertainment and few activities, I can not recommend this property as it is. We really enjoyed our pool and family time here, but was our least favorite resort. Perhaps if Hilton revamps some of those lacking options or if you are a couple looking to lounge by the pool and stay in at night. 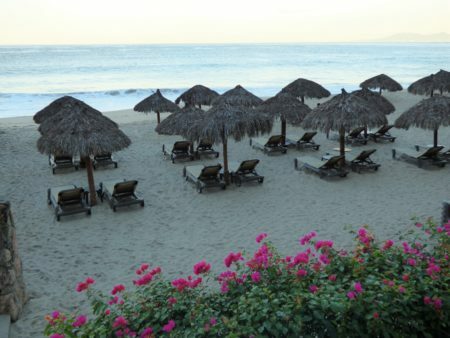 I simply think there are much better options in Puerto Vallarta. The pretty architecture of the Hilton Puerto Vallarta. Many rooms have lovely Jacuzzi balconies. 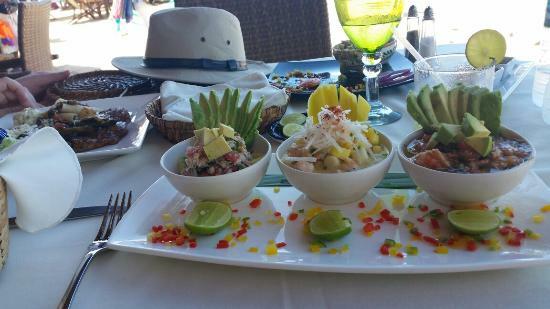 La Palapa in Old Vallarta offers a welcome change of pace from all inclusive dining. 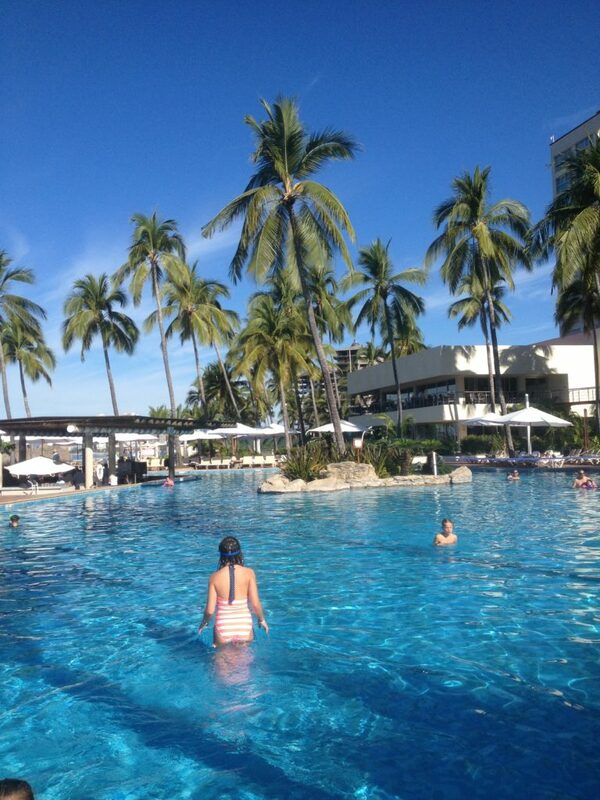 By the time we checked out of the Hilton, we were excited to experience a new resort and fresh area of town. So we headed over to the Marina area for a stay at the Westin. The resort is walk-able to the marina area with all its shops, dining, and boat excursions. Really a nice change of pace after a couple of quiet nights at the Hilton. Plus we had booked a two story suite with double balconies and our own Jacuzzi. The Westin did not disappoint. OutdoorLUX regained. 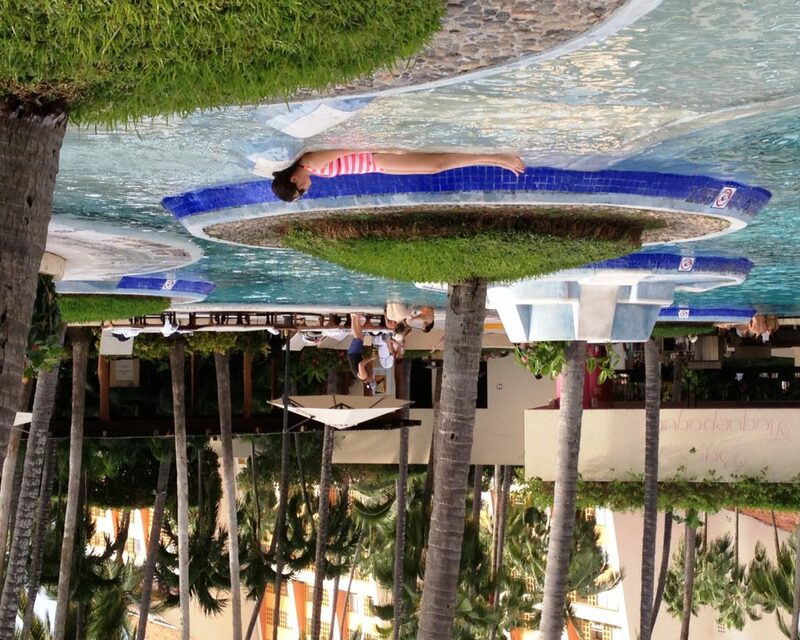 The Westin had the largest pools of our trip, complete with warm in pool mosaic loungers and swim up bars. Second floor of our suite with the famous Heavenly Bed. We enjoyed being back off the all-inclusive by this time and the choices it offered. Because food is relatively reasonable compared to the US, the options are plentiful here. walking over the first night to the lively marina area we had a wonderful time at Victor’s Place on the patio overlooking the boats. 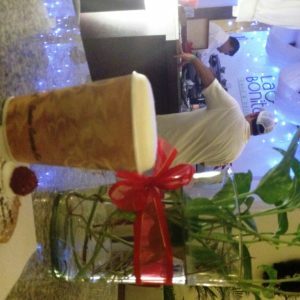 The service was exceptional, the owner generous and charming. Complimentary iced coffee drinks for dessert and ice cream for our girl. Along with the seemingly required tequila shot with Victor himself ( how does he stand by nights end?!?). The view from our spacious patio at the Westin. He will even cook your catch if you hooked something good earlier on a one of the docked boats. Not fancy, but really friendly and fun. We always had breakfast in our included lounge at the Westin, but I hear victor makes a mean breakfast if you are over here catching a boat. The marina area offers great outdoorLUX adventure options. 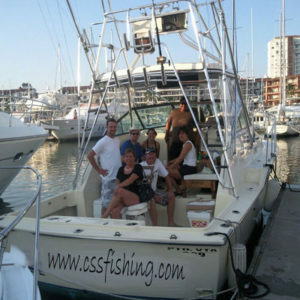 Marina Vallarta Golf Club, Charlie’s Sport Fishing Charters, ZipLine Tours, and Five Elements luxury boats for some whale watching or scuba. The spa at the Westin is lovely, but there are also nice day spa choices ( Chaac Spa for instance) with great prices at the marina as well. We enjoyed the variety of merchants selling open air along the marina at night, and found our best bargains (after negotiations) here. 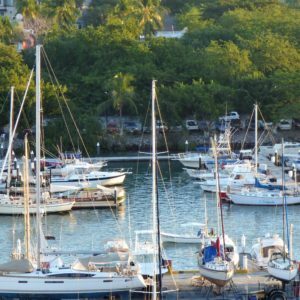 Game fishing, whale watching, or scuba trips all leave out of the marina daily. 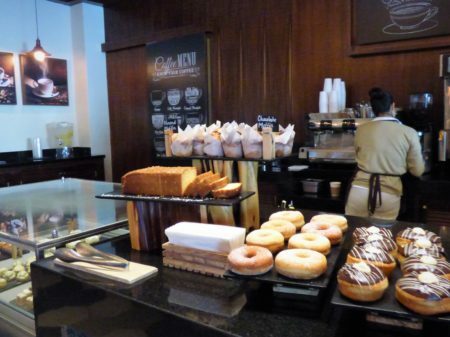 There are many dining options within walking distance to the Westin. The marina offers a lot of outdoorlux adventure options. 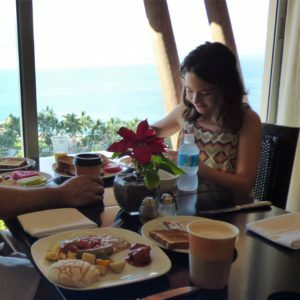 Breakfast at the Weston Concierge room with sweeping ocean views. Our suite had a great fully stocked kitchen. Overall, we were very happy with our stay at the Westin and would come back. The outdoor pool areas were definetly outdoorlux. The food at the swim up bar was made before your eyes and served with a whole cocunut ddrink for a very reasonable sum. The heavily “vendored” beach wasn’t our favorite, but they had a great private beach volleyball court. 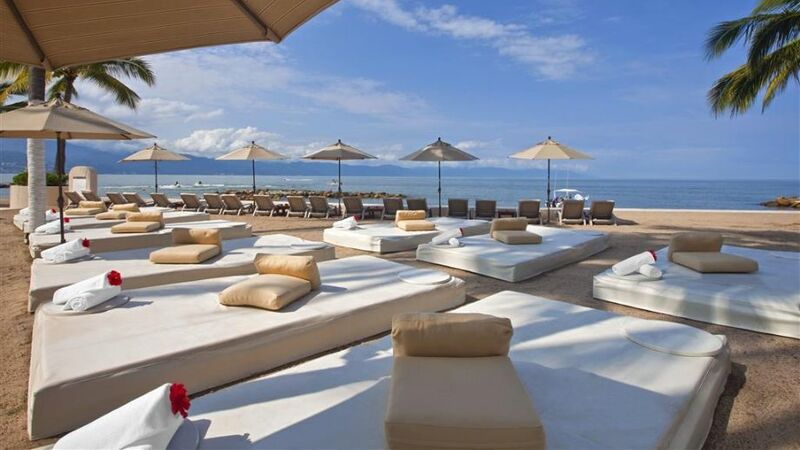 The stylish beach loungers at the Westin Puerto Vallarta. Beach Volleyball with the fun and energetic activity directer was a international blast. The rooftop concierge room was a great place to start the day or enjoy a cocktail before dinner. The jazz music at the outdoor restaurant was wonderfully relaxing with amargarita in hand. And the bathrooms and beds were the best of our trip. What a great ending to a wonderful family vacation. yes, we definetley found more than our share of outdoorLUX south of the border. And we will be headed back for more, God willing! 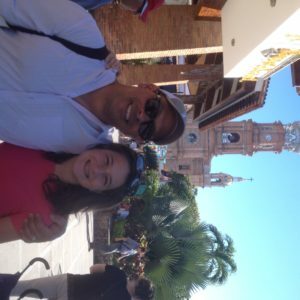 Hasta luego Puerto Vallarta, and gracias. There was always a beautiful place to relax outdoors at the Westin. Banderas Bay Sunset, Gracias Mexico for an wonderful trip.